Tony Kelly, Aaron Cunningham and John Conlan celebrate. 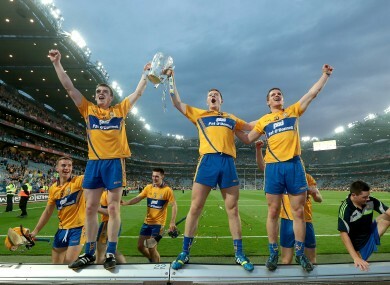 CLARE’S TONY KELLY believes the Banner’s never-say-die spirit was pivotal in clinching the Liam McCarthy Cup in yesterday’s All-Ireland senior hurling final replay yesterday. A total of eight goals were scored during an enthralling 72 minutes of end-to-end hurling with Davy Fitzgerald’s men eventually winning out by a six-point margin. While 19-year-old Shane O’Donnell was the star of the show, Ballyea forward Kelly waded in with three points during an excellent performance and says it was vital to keep their composure. “I suppose we won it!” Kelly replied when asked what the difference was between yesterday’s replay and the final three weeks ago. “I thought it was similar to the first game, it ebbed and flowed. We went up and Cork came back. In the first game when they came back we didn’t drive on. But after Conor’s (McGrath) goal I felt we really drove on and got the next one or two scores after it but they came back again and we showed the composure to see it out in the end. “Every game is different, I suppose. When we had our spell in the first half we got a lot of scores when they weren’t scoring. “It’s important to keep your head in that situation and know what you’ve done all year in training and in matches is going to come through in the end. Keep plugging and keep fighting. Email “'We showed composure to see it out to the end' - Tony Kelly”. Feedback on “'We showed composure to see it out to the end' - Tony Kelly”.